When a dessert comes into fashion you see it everywhere – in food magazines, on restaurant menus and served up by friends who entertain. A couple of years ago chocolate fondants – those tricky little puddings which are all about timing – were very much in vogue. A pool of delectable melted chocolate pours out when you stick your spoon into the middle – well that’s the theory. If you’ve managed to over-cook them, as I’ve done on more than one occasion, they’re still delicious. One of my all-time favourite desserts. Turn the clock back even further to the 1970s and 80s and everyone was making Orange and Almond cake, where you boil two whole oranges until soft, whizz them to a purée, then add them to the cake mixture. I believe this cake made its debut in Australia in Claudia Roden’s Book of Middle Eastern Food, but recipes were soon popping up everywhere. Some versions don’t use any flour, making them good for celiacs. 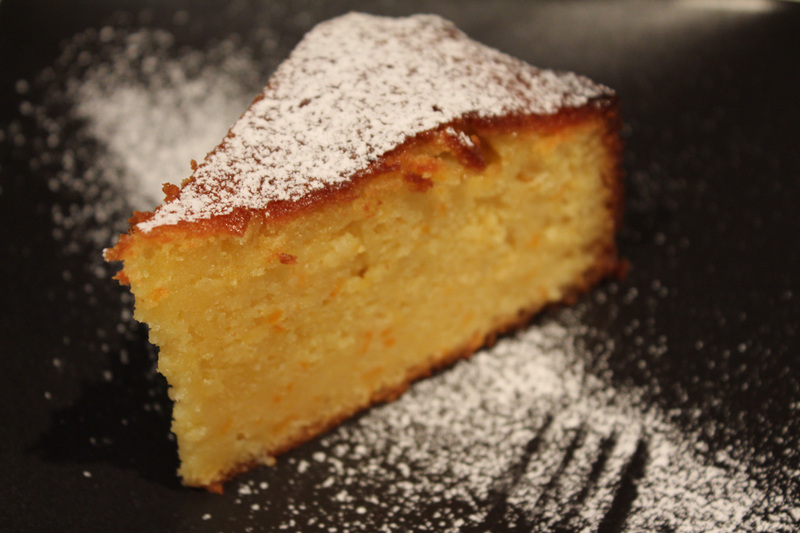 Once again we have a huge crop of cumquats, so I decided to make this cake using cumquats instead of oranges and it was a great success. If preferred use two oranges or even mandarins. Preheat oven to 180ºC and line the base of a 22cm cake pan with baking paper and grease the sides. Place cumquats in a pan and cover with water. Simmer for 10 mins or until soft then cool. If using oranges they will take 20-30 mins. Cut in half and remove seeds. If you need to grind the almonds, do them first in the food processor, then add remaining ingredients for cake, including the cooked cumquats, skin and all. Mix until smooth, stopping once to scrape down mixture from the sides. Tip mixture into cake pan and bake for an hour or until a skewer inserted in the middle comes out clean. Ovens vary so start checking after 45 mins. Meanwhile make the syrup – place all ingredients in a small pan and simmer for 5 mins. Make holes over the top of the cake with a metal skewer and spoon the warm syrup over as soon as it comes out of the oven. The syrup will be absorbed. Serve dusted with icing sugar, either warm or at room temperature, with a dollop of thick cream. This entry was posted in Recipes and tagged cake, dessert, dinner party, easy, family, party food by Linda Peek. Bookmark the permalink. Yum, sounds good. Unfortunately I’ve just made cumquats in syrup with my crop…..